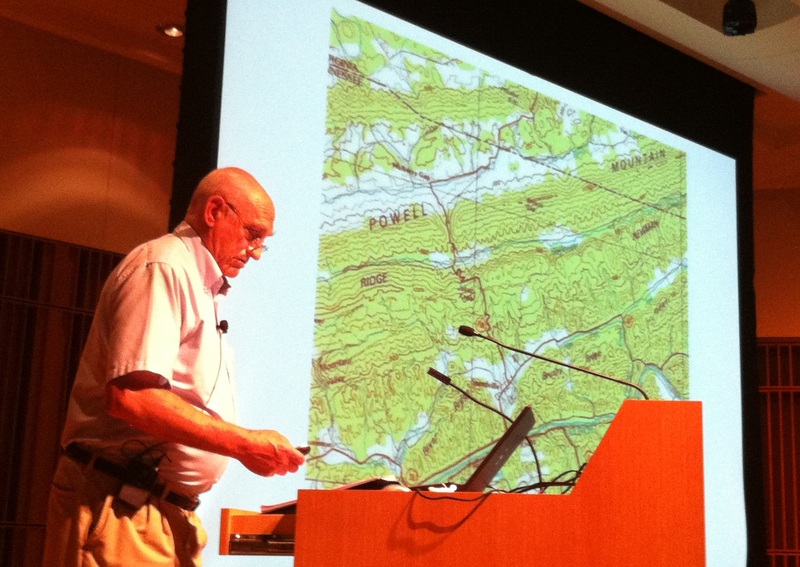 Wayne Winkler, Jack Goins (pictured above) and Roberta Estes were honored to be able to present and record the first, and possibly the only, comprehensive Melungeon-focused series that includes an introduction to Melungeons, their history and heritage, their migrations and the results of the landmark DNA study, Melungeons: A Multi-Ethnic Population. The Allen County Public Library, in Fort Wayne, Indiana is a leader in genealogical research and also in the preservation of history. Their facility includes a state-of-the art auditorium and television studio. They tape many shows there and now, we’re proud to say, our series will be added to their catalog of free videos available online. We will provide the links when they become available. These presentations were really the culmination of decades of work. The icing on the cake is the DNA study that has clarified the history of the Melungeon people and the core families. Roberta began the day with an Intro to DNA and Genetic Genealogy explaining how DNA for genealogy works. This session is always popular, and this event was no exception. Roberta uses her own family pedigree chart as an example and nearly always meets a new cousin or two. There are lots of DNA tools in the genealogists tool box, more now than ever. Wayne Winkler’s presentation, The Melungeons: Sons and Daughters of the Legend provided an overview of the mysterious mixed-ethnic population first documented in northeast Tennessee and southwest Virginia in the early 19th century. Wayne is extremely well-spoken, and even though I’ve heard him before, I’m always caught up in the spell he weaves. Wayne’s book, Walking Toward the Sunset, The Melungeons of Appalachia goes a bit deeper than his presentation, so I would encourage everyone interested in an accurate overview of this topic to read his book. Jack Goins’ session began the afternoon. How fitting that Jack is the Hawkins County, Tennessee archivist. His presentation, Examining our Melungeon Neighborhood and Migrations, tracked the original Hawkins County Melungeon families backwards in time, through the New River area, through the Flat River area and back into Louisa County in the mid-1700s. Indeed, this core group was there, together, before migrating in steps towards Newman’s Ridge. Jack’s photos of the actual locations bring them to life. Jack’s most recent book, Melungeons: Footprints from the Past was published in 2009 and details the history, with source documentation, of the Melungeons, beginning in Hancock and Hawkins Counties in Tennessee. This is a must read for anyone researching Melungeon families. The final presentation of the day was given by Roberta Estes, taken from the academic paper recently published in the Journal of Genetic Genealogy, Melungeons: A Multi-Ethnic Population. Roberta, Jack Goins, Janet Crain and Penny Ferguson co-authored the paper. This paper uses the genetic genealogy information from participants in the Melungeon DNA projects to paint a fuller picture of the Melungeon core families, and therefore, of the Melungeon population as a whole. The Melungeon core families, as identified by their paternal (surname) lines include European and African progenitors, about half and half. All maternal lines tested have been European. There was no direct paternal or maternal Native American heritage found, as had been expected, but there are two lines that are ancestors to the Melungeon families that include Native lines. It’s also of interest that all of the African lines, except one, are found together in Louisa County, Virginia, but the Native lines don’t enter the pedigree chart until later, on subsequent steps of the migration to Tennessee. Roberta and Jack would like to stress that the DNA project is ongoing and people connected to these families are encouraged to join. Questions? – Contact Jack at jgoins@usit.net. Following the presentations, the speakers answered questions and had a book signing. Several people had questions about DNA and how to use their results to discern things like ethnicity. One very nice gentleman, Gary, offered to be a guinea pig, so indeed Roberta took him up on his offer and performed a somewhat impromptu DNA analysis. This gentleman had an African paternal line from Cameroon, but a quite rare maternal European line. Both his paternal and maternal lines had been enslaved, so indeed, the European maternal heritage was a very unexpected result. His autosomal test results showed that he was about half European and about half African. Roberta’s business, DNAexplain, includes writing Personalized DNA Reports for customers. Following the sessions, each speaker was asked what they believe were the salient points of the sessions and the project as a whole. Jack said, “what is very important or noticeable to me is examining events in our history like the illegal voting trials for this example. All of the Melungeon men tried had African paternal heritage, except possibly one who took his mother’s surname. Three of the Collins were brothers, sons of old Benjamin and Zachariah and his brother Lewis.” Jack told me that when he saw the record, in the archives, that Vardy Collins had paid the fine for illegal voting, instead of fighting the allegation, he knew in his heart that we would likely find African heritage. I know that the results of the DNA study have disappointed a few people who were hoping for Native American results. Some of the news reporting has, unfortunately, fanned those flames by what I would characterize as “race baiting.” As authors and interviewees, we are not afforded the opportunity of reviewing the articles or interviews before they are either published or broadcast. The Melungeon study and the study of genetic genealogy isn’t about race – it’s about heritage. It’s about allowing your ancestors to reach forward in time to you with the truth that only their DNA can reveal. Allow yourself to hear their whispers. It’s their gift to you. It’s about honoring those ancestors, the experiences they had, the trials they endured, all of which, combine to make you who you are today. It’s about using DNA as the tool to raise the veil that covers the distant past. To want them to be something they were not is to dishonor who they were. We would like to thank the Allen County Public Library for their hospitality. I would like to thank the other two speakers for volunteering to do this presentation. It means a full day’s drive for both Wayne and Jack, each way. We all volunteered our time so that this important information can be preserved for future generations. We also want to thank all of the Melungeon descendants who have joined the projects and contributed their genealogy information. This entry was posted in Ethnicity, Melungeon and tagged General Information by Roberta Estes. Bookmark the permalink. I have had my dad’s dna through familytreedna. How do I go about finding out if there is any melungeon? Great article. I have always been curious about the Melungeons since I read an article about them years ago. I remember there was much speculation early on that they may come from Turkey, etc. It is wonderful that we live in an era where DNA can help answer some of these riddles. I look forward to viewing the videos in the future. Glad the videos will be available. I wish I have been able to attend, but I had daughter & granddaughters visiting. In 2009 I attend the MHS presentations in Rogersville. I have relatives who settled and married on Newmans Ridge. Great article in your publication! Near the close, I saw a footnote that includes one of the surnames in my family. It belongs to my maternal great-grandmother (Sweatt or Sweat) who I have not been able to find any paper trail before she came to TX in late 1890’s with my maternal great-grandfather. The oral history is that her father was a European from Holland; this is on her death certificate. But there was also oral history that she had Native American blood too. I can now possibly explore more fully with the Lumbee (p 29) mentioned in the article by Virginia Easley DeMarce. I know that her mother’s origin is sub-saharan Africa because my haplogroup is L3e1a. The autosomal test from 23andMe was adjusted from 7% Asian in 2010 to 2% in 2011. The Family Finder test (2012) at Family Tree DNA showed only Sub-Sahara and European admixture. I received what little information I have on my maternal great-grandmother (Sweatt or Sweat) from a cousin who is now deceased. Because of the footnote in your article I now have some new leads to explore. It opened to me some new counties in NC that I had not considered and the VA connection that DeMarce mentioned in her article is completely new knowledge for me. I just encountered a situation that reminded me of this excellent article of yours. I started up a y-DNA surname project to track my mothers family and recruited my only three living male 1st cousins who carry that name. The first set of y-67 results have recently been posted and within a day an exact match appeared with an individual who had only tested to 37 markers back in 2008. Apparently the individual has had very few close matches and never a perfect match like my cousin’s. But the individual has a different surname. How common are such occurances? What possible explanations could their be? I will be better prepared to address such situations after I get more data from more cousins but where should I start in the meantime? How likely is Melugeon decent based on surnames. My ancestry includes Sweat, McDonald, Cox, Hilliard, Booth, and Stafford surnames… All of which I find listed in Melungeon family surnames. My family came from the Carolina’s to eventually settle in Southeast Georgia (Okefenokee Swamp). And on my Sweat side there are listed Mulatto’s in census records. If you read the paper, it will give you the list of all people ever found and referenced as Melungeon. None of these names are on that list. However, Sweat is often found in the mixed Native communities of both North and South Carolina. My grandmother was Darcus Goldie Minor Yeary daughter to Mary Minor Yeary her father and mother were ALFRED MINOR (ZACHARIAH2, HEZEKIAH1) was born August 12, 1830 in Hawkins County, Tennessee, and died April 21, 1907 in Kyles Ford, Tennessee. He married CHANEY FIELDS 1865 in Tennessee. She was born December 1834 in Tennessee and died 1905. Listed as ‘Portergee’ on 1880 census- scratched out and “W” written over. I just received DNA results which showed Native American, Jewish and many other ethnicity. Chaney’s family was one of the Choctaw Freedman families – those were the slaves of the Choctaw Native people and when they were freed, they were able to join the tribe as members. Thank you for the info, are you a relative of Chaney? I am a direct descendent of George “goldenhawk” Sizemore. Of importance is my DNA results came back 20% Iberian peninsula (spain/portugal), 1% w. asian (indian migration) 45% w european, 19% scandanavian (viking? ), 8% english and 4% irish. Hello. I am waiting on dna results and I have suspected Native American lines from both oral history and also the picture of my grandma you can tell she has other ethnicity in her other than just European. The oral history says Cherokee. But, after researching I realize that may not be accurate. So, when it was discovered that I have a Cooper great-grandma someone suggested she could have been Melungeon or Lumbee. So, anyway, 23andMe does not have my dna results done but they have populated the dna relative surnames for me and they include 5 CORE Melungeon names plus many related Melungeon surnames. I cannot connect with the cousins yet but I am very interested in this now as it seems this person may have been onto something. The 5 Core names are Mullins, Collins, Gibson, Moore and Williams. Some of the other names besides Cooper is Adkins, Allen, Brown, Evans, Wilson and many more. This is just really exciting for me. It would be neat to finally figure out more about my grandma. She died in 1942 when my dad was 2 and all we have is her one photo staring back at us. What is she saying to me? Fascinating paper. It makes me wish I had Melungeon ancestry. For a bit we thought we might, but if our southern lines are mixed, it would have been other folks. I haven’t yet researched any of my “interesting” lines, but likely will soon. Your work certainly illustrates the pitfalls in this kind of research: where origins are mysterious and there are conflicting family stories, with obscure and conflicting records as well. I can’t rely on genetic testing: Even if I could afford it, there is the matter of finding and successfully contacting the appropriate relatives and countering possible (probable) resistance–religious issues on both counts, Well, that and the usual denial. Hitting the paper trail for clues….